Mix milk, butter, chocolate chips and sugar in a large bowl. Microwave for 0.5-1 minute until butter is melted and sugar is dissolved well. Add egg, cake flour, baking soda, and cocoa powder to the chocolate mixture. Stir vigorously until smooth. Prepare your cake pans. Divide cake mixture evenly into 3 6"x6"x2" prepared square cake pans. Bake for 9-10 minutes. Let the cake cool. While the cake is in the oven, make the frosting. Mix softened butter, cream cheese, blueberry syrup and Rum until smooth. Add powdered sugar and stir until creamy. To prepare Rum syrup, simply mix Rum and blueberry syrup in a small bowl. Place one layer of cake on a desired serving plate. Use a bread knife to cut the extra part if your cake is not flat. Apply Rum syrup on the cake by brushing it with a pastry brush. Spread a thick layer of frosting on the cake evenly. Gently place the second layer of cake on top and repeat step 9 and step 10. 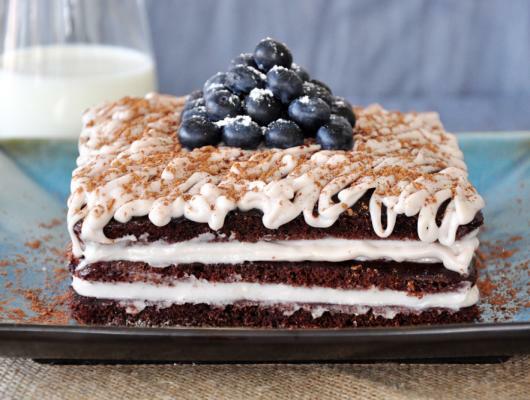 Sprinkle the frosted cake with cocoa powder; garnish with fresh blueberries; sprinkle a dash powdered sugar onto the blueberries. Serve! 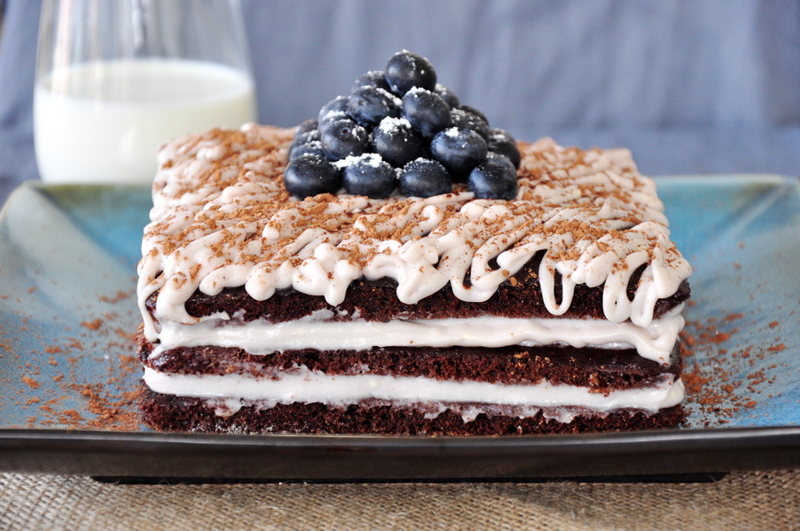 An easy-to-make mega delicious blueberry chocolate cake with Rum and cream cheese!